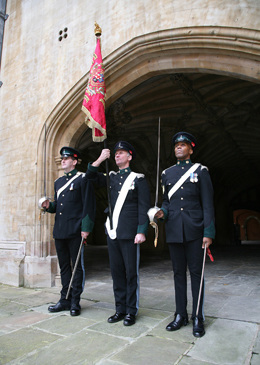 The current Guidon was presented to the Regiment by Her late Majesty Queen Elizabeth The Queen Mother to mark the amalgamation of the Inns of Court Regiment and the City of London Yeomanry in 1961. Guidons were originally emblems of Knighthood and were used as a rallying point for troops in the same way as Infantry Colours. The word "colours" covered not only the Colours proper of the Infantry but also the Standards of the Household Cavalry and Dragoon Guards as well as the Guidons of the Dragoons. All three are direct descendants of the banners of the knights and barons whose followers made up the armies of Crecy and Agincourt. Originally the distinguishing marks of the leaders, they gradually became the means of identifying the units themselves. In modern times Guidons or Colours are not carried in battle but because of their historical significance are the most highly treasured items of a Regiment's property. As a general rule Colours are presented to Infantry Regiments and Guidons to line Cavalry or Yeomanry Regiments, their present day purpose being to form a suitable centre for parades and ceremonial occasions. Only one Guidon is presented to a Regiment and this is of crimson silk damask 2 feet 8 inches deep and 3 feet 5 inches to the points of the swallow tails, embroidered and fringed with gold. It is carried on a pike 7 feet 4 inches long with cords and tassels of mixed crimson and gold. In the centre of each side of the Guidon is a wreath of mixed roses, thistles and shamrocks with a Saint Edward's Crown on the top. Inside the wreath is the Regiment's title. The Battle Honours of the Regiment are depicted on scrolls on both sides of the Crest showing the last war Honours on one side and the earlier Battle Honours on the other. 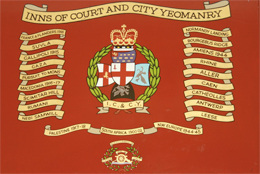 The Inns of Court & City Yeomanry has 26 battle honours dating from 1900. The Guidon with Guard of Honour outside Lincoln's Inn Chapel on Remembrance Day.